NOTE: Spoilers abound! Proceed at your own risk. 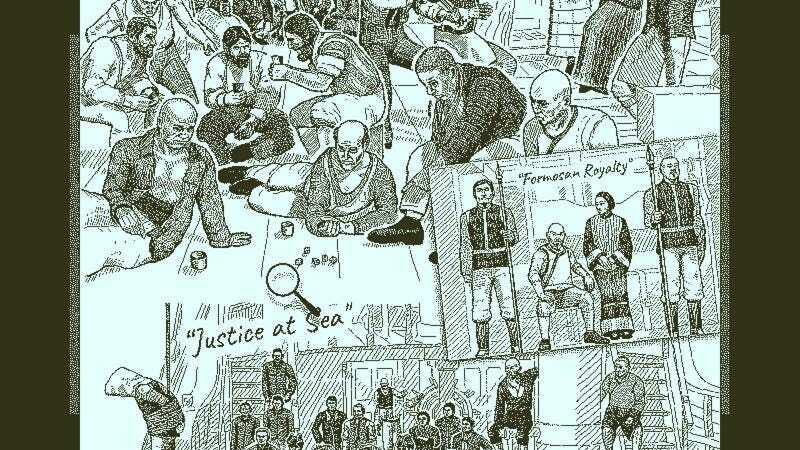 Like many, I followed Lucas Pope’s progress on Return of the Obra Dinn with fascination. From an early demo circulated in 2015 through the game’s protracted (and largely solo) development, I was gripped by the uncanny aesthetics, sea-bound mystery, and supernatural sleuthing mechanics. The transition to a first-person 3D world seemed a stark departure from the pragmatic interfaces of Papers, Please and The Republia Times, but I trusted (and hoped) Pope would wring something special from a fresh blend of narrative and gameplay elements. In many ways, the finished product — released in October to a word-of-mouth fanfare enjoyed by a shrinking echelon of indie devs — delivers on these promises. Obra Dinn is a dedicated, singular vision: a fantastic tale of hubris, remorse, and explosive violence woven through a sprawling logic puzzle, couched in the brilliant, cheeky conceit of nautical insurance assessment. My partner and I completed the game over three sessions in about 8 hours, and thoroughly enjoyed every devious tick of the gears as we deduced the foregone fates of the ship’s crew. Still, as satisfying as it felt to play, I’m unsettled by how much the game’s sense of mystery — the threat of ever-encroaching doom; the questions that linger after the main puzzle is solved — is built on tiresome tropes involving the story’s racialized and feminized characters. Just to throw the few of you sticking around a bone: I understand that Obra Dinn is a period piece. I understand that it reflects a time and place where Black and Brown crewmen were marginalized and distrusted by white sailors. I understand that women would be shut out of decision-making. I also noticed, as you may have, that Pope included a Black Carpenter with a white Carpenter’s Mate — a distinctly ahistorical gesture, and one that suggests choices were made about where to adhere to and where to diverge from seafaring canon. It goes without saying that a good mystery — especially a capital “W” Weird one — leaves some things unanswered, and Obra Dinn leans heavily on the horror of the unexplained and/or inexplicable to drive the narrative. At the crux of these efforts is the altar or chest-like vessel that the ship’s Formosan (indigenous Taiwanese) passengers have brought aboard, the breaching of which spurs the otherworldly chaos of the story’s second half. We don’t know much about the Formosans, except than that they’re part of a (never-named) royal family, that they speak Taiwanese, and that they have prior knowledge of the altar. When, for reasons unknown, officers of the Obra Dinn steal the altar and drag it out to sea along with two members of the royal line, mer-creatures attack the party, and one Formosan opens the altar, unleashing the monster-repelling properties of a magic shell inside. From there, things only get worse, with three of the many-breasted creatures (and more magic shells) hauled aboard, crab-riding banshees marauding the crew, and, finally, a giant kraken descending upon the doomed vessel, all while the remaining humans murder each other in a series of Very Bad Decisions. Just when all seems lost, the captain throws the magic shells overboard and kills two of the mer-creatures, briefly quelling the sea’s wrath. A third creature is released along with the shell from the altar, on the condition of ensuring the Obra Dinn’s safe return to England. A final burst of misadventure ensues, several years after which the player is dispatched to the long-empty vessel to assess the diverse and extensive damage endured. At first glance, it’s quite the ripping yarn. Men at sea with bad intentions mistreat each other, invoke the evil magic of the deep, reap the deadly wages of sin, the end. But digging a bit deeper, we’re presented with a situation where the story’s most prominent racialized characters (the Formosans) are inextricably entwined with magic, nature, and death, while the white officers are doomed by their (greedy, lustful, fearful) actions. Meanwhile, the game’s highly feminized (rows of breasts, long hair, hourglass figures) mer-creatures spend most of the story as helpless hostages in a dudely battle with the forces of the sea. The story’s human women are also largely absent, except as witnesses to (or survivors of) the men’s destruction. The association in western media of racialized bodies, cultures, and languages with the unknowable — and therefore the threatening — has been extensively articulated by Edward Said, Sara Ahmed, and many others. Whether Pope intends it or not, his use of Formosans as bearers of the story’s supernatural elements invokes a racist Orientalism that simultaneously romanticizes and dehumanizes these characters, obscuring their motives behind a screen of mysticism and aligning them more with the story’s sea monsters than the other humans on the ship. Some of this opacity can be attributed to the racism of the white seamen, but there is no good reason why Pope couldn’t have given players a Formosan perspective in the vignettes by which we deduce the rest of the narrative. Such a turn might have enriched the world and raised the stakes of the tragedy while adhering to “realistic” social dynamics. Instead, the Formosans of Obra Dinn die with their secrets, consumed by the sorcery that defines them. The relegation of women and feminized characters to victimhood and violence is also more-than-well-documented, yet Obra Dinn uncritically replicates several of these tropes. The story’s siren-like mer-creatures arrive with a bang, attacking a skeleton crew of conspirators to reclaim their stolen shells. However, after the Formosans use their altar to stun the monsters, they become helpless, semi-naked captives, transported to the ship and imprisoned in the lazarette to await murder by a captain desperate to save his own skin. One of Obra Dinn ’s most uncomfortable moments, and a scene that has stuck with me since, occurs when the crew is lowering a captured mer-creature into the hold. Just before the creature thrashes and kills a seaman with its tail barbs, the ship’s cook jokes loudly about cooking and eating it. His heartlessness is obvious, and we are clearly meant to feel empathy for the creature, but in a game where dialogue is sparing and every word matters, why do we need this additional gesture of cruelty, except to be reminded that the game sees this character as meat? The implication that the mer-creatures understand human language compounds the gendered violence they endure, both in the above scene above and the story’s denouement. When the third mate releases the final creature in the cargo hold, he demands the Obra Dinn receive safe passage back to England in exchange. The fact of the ship’s reappearance suggests this bargain has been fulfilled, as does a glimmer of shell-magic visible off the side of the ship throughout the game. What goes unexplained is why the mer-creatures never answer back; why they toil and fight and die silently, trapped between the violence of their human captors and the will of the ocean, which they are messengers but never agents of. One might argue that ascribing womanhood or femininity to these monsters is too much of a stretch; that their nakedness and breasts are simply about the traditions and stories from which they emerge. But the human women of Obra Dinn face a similar silencing, largely trapped in the periphery of the story, dying as symbols of men’s failures rather than their own decisions. Even the women who escape — and are among the very few survivors of the whole ordeal — serve merely to deliver messages from the man who hires the player, claiming they are too traumatized to offer any information of their own. Once again, these narrative choices can be rationalized within the power structures of the game world, but their reliance on stereotypes about women characters feels lazy in 2018, especially as the underlying sexism of the video game industry is finally penetrating mainstream consciousness. The criticisms I’ve raised here are not meant as an attack on Lucas Pope, who clearly has a massive gift for transforming tense human stories into powerful game mechanics. But, as a white guy game dev and writer, I feel it’s important to consider the racial and gendered assumptions that inform narrative design, especially when an otherwise great game is dragged down by failing to challenge these patterns. As much as I loved playing Obra Dinn, the quality of the story didn’t rise to the level of the experience surrounding it, and I think these shortcomings are worth addressing. By openly discussing these issues, at best, we move towards a design culture in which racism and sexism are left where they belong: at the bottom of the sea.